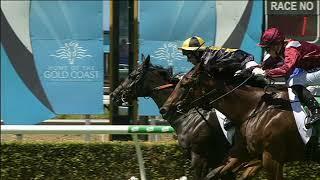 TIGER LOVE showcased her fighting qualities to score an impressive maiden win at start No.2 at the Gold Coast today. Ridden on the speed by Scott Galloway, the two-year-old Better Than Ready filly fought off the challengers to commence her preparation in style. Trainer Chris Munce said the he would continue to press on towards the feature $155,000 Capricornia Yearling Sale 2YO Classic (1200m) at Rockhampton on April 13 with the filly. "From a wide barrier, she showed plenty of speed to sit outside the lead and showed terrific courage to be able to battle on and win the race they way she did," said Munce. "There's not a lot of her, she's a light filly and she probably doesn't need a lot of work. But the courage she showed is that of a nice horse. "She'll have a trial over 1000m before we take her up to Rockhampton for the race in April."